I lead a very good life. I would generally say that I am upbeat, resilient, and able to cope with the painful and stressful stimuli that present themselves to me from time to time. That is, until yesterday. You see, yesterday held in store for me something so awful, such a betrayal of trust, that I scarcely think I can recover. I am considering a drastic change of course, an entirely new life, because I would do anything to avoid feeling the way I felt at around 12:45pm yesterday. Yes, it’s true: despite all of my experience, know-how and good instincts, yesterday afternoon I mistook unsweetened cranberry juice for regular cranberry juice due to crafty labeling at the neighborhood Trader Joe’s. I am writing to you from a quarantined hospital bed in an undisclosed location for a period of convalescence and reflection. As an active yet clumsy person, I have had the misfortune to have many horrible things pass my lips: in middle school, I somehow ended up with two small beetles in my windpipe during a mile run. At scuba training, I ingested many litres of very cold, very dirty Dana Point seawater. In college, I not once but three times took sips from cans that cigarettes had been extinguished in, as well as multiple run-ins with sour milk and corked red wine. But with all of those things, at least there is some rhyme or reason. Beetles can’t help flying down my windpipe. Before being used as ashtrays, my cans of soda held within them great sugary promise. Even sour milk and abused red wine were, at one point, something of value. But this? This acrid, cloudy Death Serum was absolutely unholy. Why even have it on the shelf? For adrenaline junkies? What? Your Rice Rocket in the shop? Are all of the skydiving planes booked today? My advice: if you want a less regrettable experience, go tattoo your face with the confederate flag, or maybe the words “Cop Killa”. That way you’ll still be edgy but not nearly as useless as my poor, cauterized taste buds. Having this stuff innocently sitting on the same shelf with lovely juices infused with pomegranate, apple, or hibiscus is like setting an armed Howitzer next to the teeter totter on a playground. Someone’s going to get hurt. I tried to tough it out, once I realized I had taken my life into my own hands and lived to tell the tale. I poured nearly a quarter of a cup of agave syrup into the alleged cranberry emulsion, but it was as if the juice was neutralizing the sugar in the agave. Like the juice itself was drinking. Horrifying. After regaining consciousness, I phoned my friend Jennifer, who kindly nursed me back to health with nachos (the only known cure). Assuring me that she had a hardy constitution, she asked me to pour her a sample. Having finished the nachos, it was a risky proposition. Was there a Taco Bell nearby? I didn’t know. Still, she took a small sip and survived. Of course, we had to steam clean the cat and burn the curtains, but at least she didn’t truly ingest any of the stuff. As I lie here languishing, I am forced to wonder. Why? Why have such a virulent tincture hidden among such a vast selection of tasty treats? Are they trying to cull the herd in Toluca Lake? Was I on hidden camera? Is it Grays? I don’t know. Perhaps I never will. My mistrust is at an all-time high. 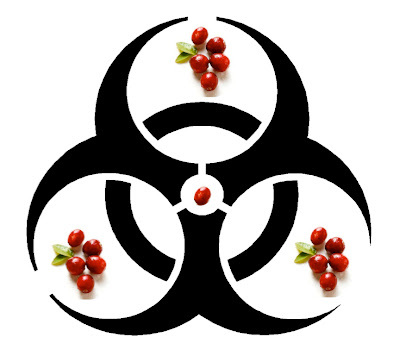 So for now, I will be forced to cut any alleged cranberry products with vodka, for safety/medicinal purposes. But even that shakes me to the core. Maybe it’s time to take a break from Trader Traitor Joe’s. A girl can only steam clean her cat so many times. NextDo you really warm up? Use it as a concentrate. Yes, lovely for flavoring vodka. Also makes an excellent tea substitute, just a glurg in a cup of hot water (and not too big a glurg, mind you.) Add a little sugar if you absolutely must. A quart of this stuff goes a long way. Sorry your first introduction was so traumatic. They should warn you on the bottle that some assembly is required. Ew, ew, EW! I, too, have made that mistake. I am glad that you are recovering. No one should ever have to go through that kind of horror. They should shelve that in first aid or alcohol mixers so no one else is led to believe that straight cranberry juice is actually potable on its own. I had an awful UTI once and everyone swore by this Cranberry Juice stuff. Not the sweetened! they warned me. BS, I say. It took a week for my mouth – no, my teeth – to fully un-pucker. Why they still sell that when there are perfectly lovely cranberry pills that don't have to touch your taste buds is beyond me. I didn't even know that they made unsweetened cranberry juice! I'll be sure to be on guard against the stuff now, LOL. Kudos on a very funny post! Are you a "super-taster"? Some people have extra sensitive taste buds (see http://en.wikipedia.org/wiki/Supertaster). My wife's one of them. She can't handle much tart, or bitter, or hot-spicy (some types of spicy are ok). She's frequently unhappy with Trader Joe's because their products tend to be extra tart or spicy. Me, I love unsweetened whatever, including cranberries out of the backage and unsweetended juice. Intensity! Yes! I'm pretty sure that the damage to my tongue is permanent…. I'm with Terry on this one. I absolutely LOVE unsweetened cranberry juice – pure, with none of those infusions to blunt its flavor. I haven't been able to find any locally for years – your post made me wish [just for a minute] that the nearest Trader Joe's was closer than 1500 miles away. T: I'm not a supertaster as far as I know. I love big flavors and in fact enjoy bitter and sour stuff especially. Weird, eh? Ditto G. I like the unsweetened stuff but diluted not straight. Miami doesn't have Trader Joe's either. I dilute the Cranberry lite juice with water as well. I had to read this post several times to realize that you merely tasted bad juice and had not actually been in the hospital. With today's food scares and infections of agricultural products, It is plausible that the wrong cranberry really might have put you in the hospital. You weren't really in the hospital, right? Turning worry mode off. Good night!